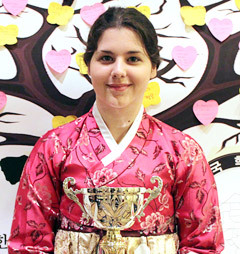 Love-smitten teen Alyssa Donovan of Maine became the first person of non-Korean heritage to win an award in the Korean speech contest hosted by the U.S. National Association for Korean Schools in Burlingame, California, on Friday. The 14-year-old American, who delivered her speech in fluent Korean while dressed in a traditional hanbok gown, said she got interested in the language after falling for a Korean-American boy. "I started studying Korean in April 2007. At first I studied it because I had a crush on a Korean-American boy," said Donovan, who placed second in the competition after cruising through the regional preliminaries. She beat over 300 participants to claim the prize. When the 10th grader from the Deering High School in Maine said, "I could not confess to the boy who made me study Korean because he moved away," the crowd burst into laughter. She drew a big round of applause when she went on to add that she "continued to study Korean, and got to love Korea instead of him." Donovan started learning Korean using Internet websites and had reached a reasonable level of conversational and written fluency within just six months, including difficult words of Chinese origin. She progressed through various literary translations and recently read the four Shakespearean tragedies in Korean. In the preliminaries of the New England Chapter, Donovan had raised herself to such a level that even students of Korean origin were unable to compete with her. She first visited Korea last August and spent two weeks playing traditional percussion instruments such as the janggu (slim waist drum), and listening to pansori and gayageum (multi-stringed zither) performances. Pansori is a traditional form of Korean opera. Donovan, who said she is considering attending university in the country, also confessed she is a K-pop addict. She has a particular fondness for singers Seo Tai-ji, SG Wannabe and Park Hyo-shin, as well as soap operas like "Winter Sonata" and "Coffee Prince." Her favorite Korean dish is soybean soup.